I had a unique opportunity yesterday: Kenny, my bear monitor, offered to take me by boat about 18 kilometers up the mighty Coppermine River to the historic Bloody Falls to conduct aquatic sampling in the rocky rapids. Heading to Coppermine: a view of Kug's north shore by boat. Kenny ably navigated the aluminium boat down the winding river. Although it was overcast and drizzly, there was no denying the spectacular beauty of the plunging, sandy shorelines and rugged terrain behind them. Not long into the journey, we spotted some flecks of colour on the dark waters – it was Angut Pedersen and his fellow students returning from their canoe trip! We passed them (they were all smiles, being on the home stretch of a 310 km journey!) and continued upstream. Soon we came upon the first signs of rapids. The choppy water was murky and hidden dangers lurked beneath…CLUNK…our propellor hit a large rock! The damage wasn’t terrible, but we quickly brought the boat ashore, deciding to hike the rest of the way. We unloaded our gear. Unlike the vast majority of the incredibly sandy landscape in the region, this stretch of land was littered with rocks. Difficult for hiking, but perfect for sampling aquatic organisms! 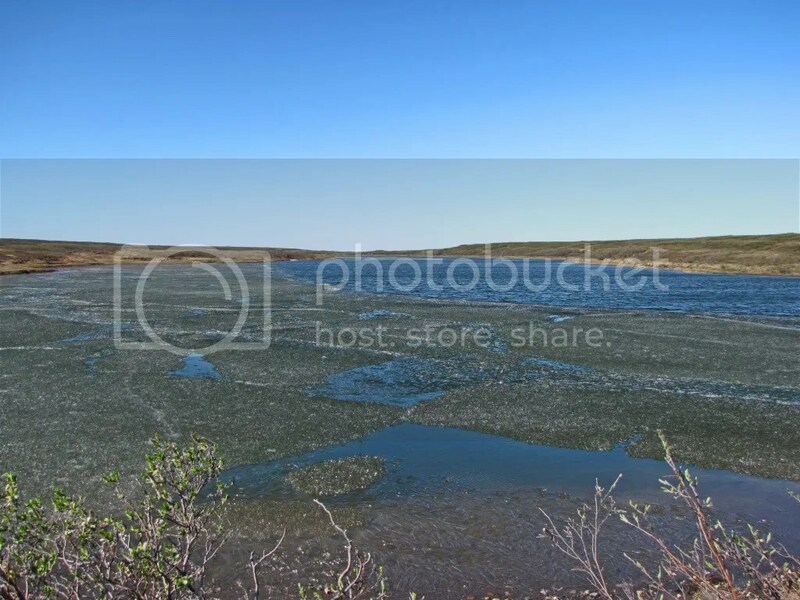 The fairly recent spring ice break and thaw added an extra challenge onshore: the ice carries a large amount of sand and this all gets deposited on the shoreline during the thaw. The rocks were slick with mud and interspersed with dripping chunks of melting ice. 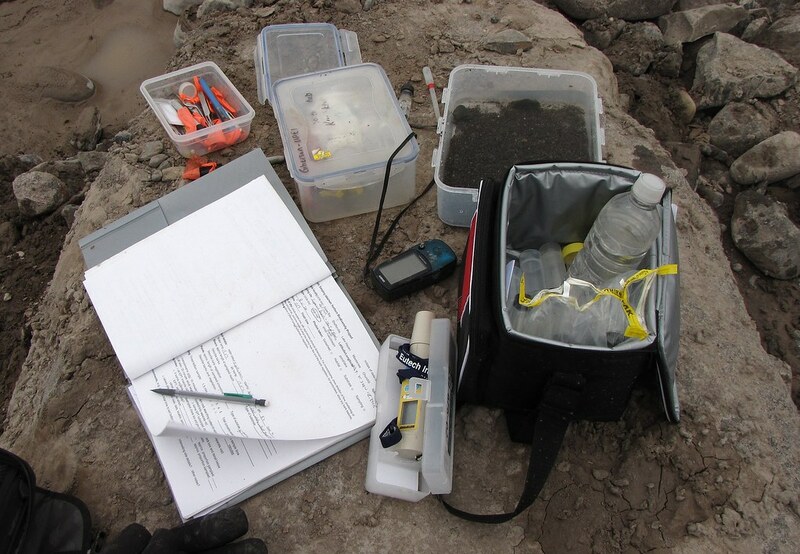 We conducted the standardized aquatic sampling protocol in the rapids…stonefly, mayfly and black fly larvae were readily collected from the water, and adults were discovered hiding from the inclement weather under rocks on the shore. The gear was once again packed, and we hiked our way about 2km upstream to a second sampling site closer to the falls. Although it was impossible to sample directly in the main rapids themselves, a brief scenic detour for a closer look was most definitely in order (click on thumbnails to enlarge). 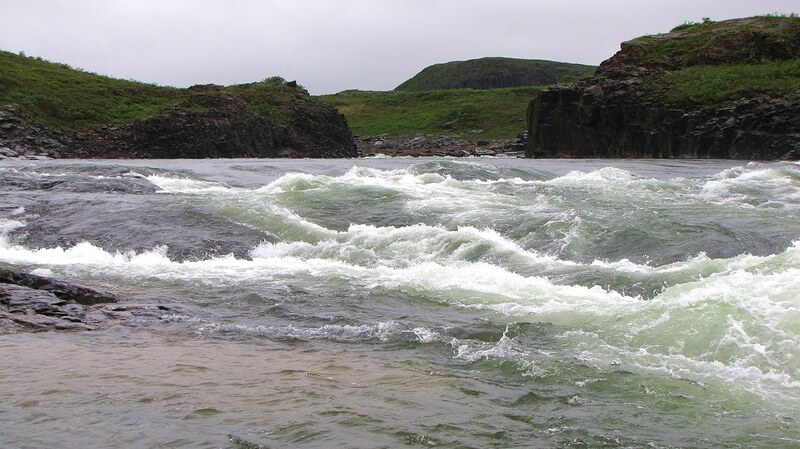 A second round of successful sampling just downstream from the rapids concluded the day. Other highlights included finding beautifully preserved grizzly bear, wolf and caribou tracks in the mud on shore, and discovering tidbits of native copper on a rock lying underwater. 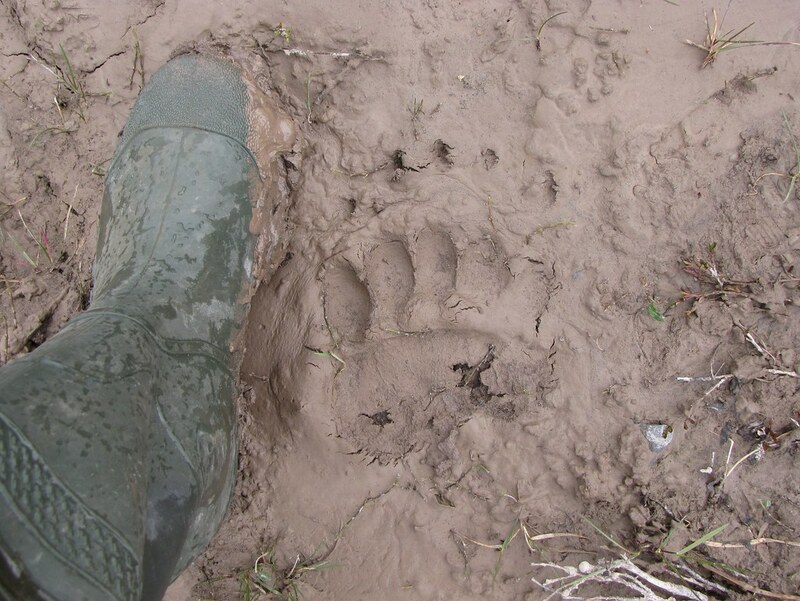 Grizzly bear track, front foot. All in all, it was a spectacular day, and one of my most memorable since arriving in Kug. Team Kug’s work is well underway…Angut, the high school summer student acting as Crystal’s field assistant/guide, has proven to be an invaluable source of local knowledge. 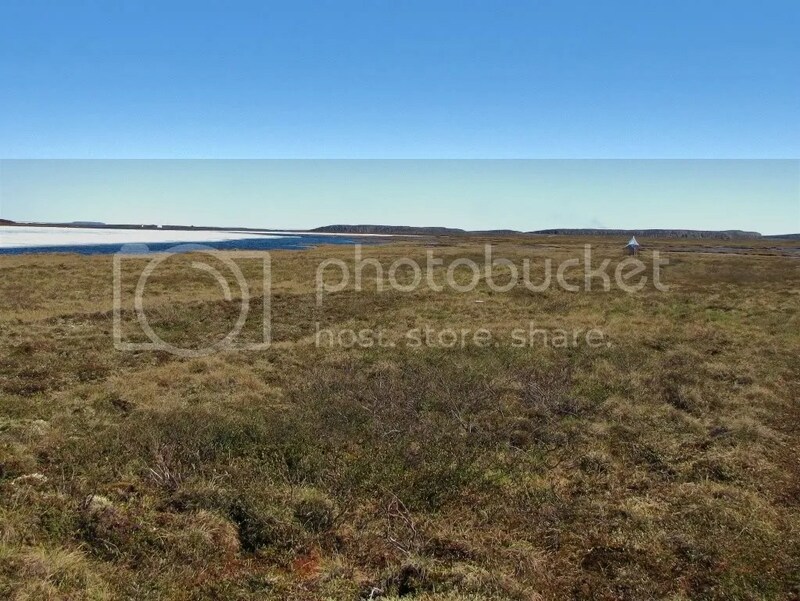 The team has been navigating the tundra trails on ATVs, locating sampling sites. Two of the standardized trapping grids are now established; you can see in the picture below that the landscape is very different than that in which the other teams are currently working. However, as barren as it may seem, the land is actually bursting with spring growth, including many beautiful wildflowers. The Malaise trap set yesterday (pictured above) already has a good catch of mosquitos, while the pan and pitfall traps are successfully snagging many wolf spiders and ground beetles, as well as small flies. Bumblebees have been sighted, as has a butterfly. The team will set up the final grid tomorrow, then hopefully start some opportunistic sampling. There are many beautiful aquatic habitats dotting the landscape; but they’ll have to thaw a bit more before any sampling can take place!